On an island famed for its rich tapestry of ceremonies, the Balinese New Year – Nyepi (Day of Silence) – is perhaps the most unique. Nyepi occurs annually in either March or April according to the Balinese calendar; in 2018 it fell on March 18. But Pengurupukan, or Nyepi Eve, is in a way just as important as Nyepi itself. 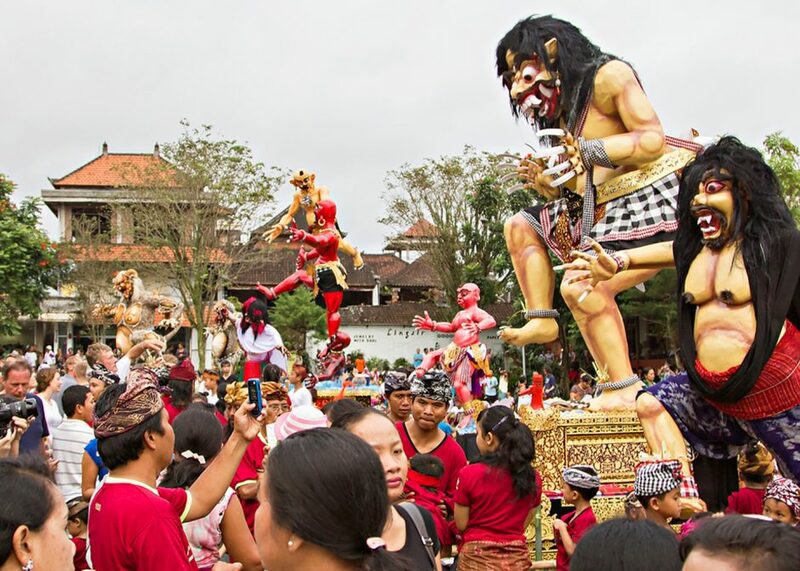 This is one of the most festive days in the Bali calendar as the Ogoh-Ogoh are paraded up and down streets all over the island, carried on litters by young men from the local banjar (communal units within a village). And what are Ogoh-Ogoh? About a month before Pengurupukan and Nyepi, strange entities begin to take shape all over Bali. You see them by the roadsides – huge balsa wood structures depicting animals, humans and figures from Hindu and Balinese mythology. As the big day approaches, papier-mâché skin is applied as well as wigs, garments and other accoutrements to make these giant beings pleasing to both the Dewa (Gods) and Buta Kala (Demons). There are various explanations of its purpose – to amuse the spirits so that they do not get up to mischief; to confuse the spirits (this is the purpose of spinning the Ogoh-Ogoh round and round at the all-important crossroads where spirits like to congregate); and to show up the rival banjar by having a much better Ogoh-Ogoh than theirs and then celebrate with copious amounts of arak (rice alcohol). At the same time as providing a diversion for the spirits, the Ogoh-Ogoh also represent them. They often take the form of traditional characters like the witch Rangda or the mythical Lion-like Barong. But you’ll also witness more modern creations – monsters on motorcycles, Rangda witches on surfboards and Shreks in shades alongside the more conservative creations. The uproar of Pengurupukan is followed by Nyepi, which is traditionally reserved for meditation (though many take the opportunity to sleep off their arak hangover!). Officially, no work should be done, lights and electrical instruments should not be switched on, and everyone must remain in the boundaries of their home. No planes land at the airport or even fly over the island. It is a kind of cleansing; an opportunity to look inside and be still in preparation for the year ahead.